As I board QF 537 at Brisbane Domestic Terminal the Third Test against the French is kicking off at Sydney Football Stadium; where, at the 11th hour, I was granted a coverted media pass to attend the sold out match. Thanks to a man I just happened to run into at the Sofitel in Brisbane two weeks before, Bill Pulver, CEO of Australian Rugby Union (ARU). I had introduced myself as the Editor-at-Large of Brisbanerugby.com and he handed me his business card and said, “Whenever you are in Sydney, give me a call.” Well I wasn’t in Sydney, I was going there, and it was 11:46am in Brisbane. Now we go back two weeks to June 4th when I just happened to be walking through the Sofitel lobby, because I knew I could get a hit of my latest addiction, free Wi-Fi. Like a junky suffering withdrawal, I took my Galaxy S5 and gingerly searched for the free Sofitel Lobby Wi-Fi. Typed in “accept” and sat back in relief while my emails, Twitter, Facebook, Instagram etc. loaded. I ordered a coffee and looked around at my fellow junkies tapping away at the phones, tablets, laptops etc. with sheer pleasure on their faces, like a heroin attic scoring a hit in Fortitude Valley. I glanced over to the reception area and noticed a young gentleman that I had never met before, but had first seen on the rugby pitch 11 years ago at Lang Park in the 2003 World Cup. With a sense of disbelief I walked over to the man and introduced myself, to which he replied, “I’m Freddy”. 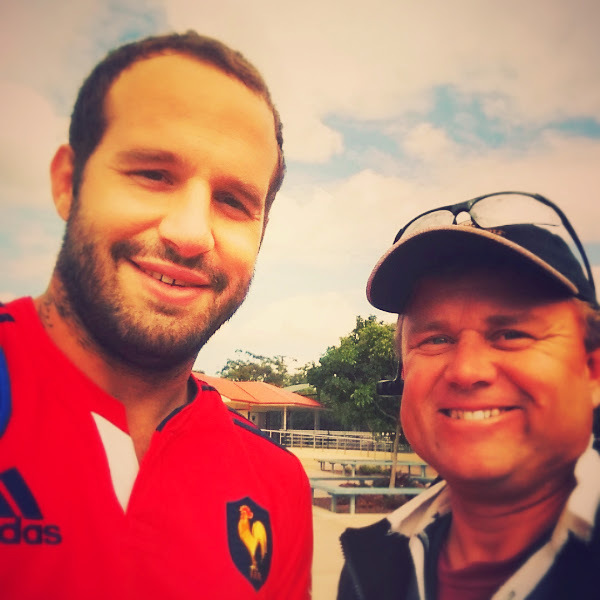 The French number 10, Fredric Michalak!